Fishing in Dorset has to be coming into its best now. The water tempreture is just about at its maximum. There are so many different species around, you have no idea what you could catch next. One of my friends was out lure fishing for Bass. He managed 1/2 a dozen Bass up to 4lb, then landed himself a 5lb Mullet on the same lure. Talking of Mullet, I noticed that there was a lot less Mullet in the harbour today, than has been recently. It looks like they are moving out to open water. Chesil seems to be one of their holding points, as they feed up for the long winter ahead. Get them feeding and they will take just about anything. I have often caught them whilst fishing for Garfish in matches. I used to use ground bait to get the Garfish in, and fish with thin strips of Mackerel on a float. Often the Mackerel would be taken by large Mullet. My biggest was 5 1/2lb, but I landed a much bigger one, that snapped the hook length, just as I landed it and slid back down the pebbles into the water. There are a lot of Silver Eels being caught from a lot of differet marks. This is a great sign, as exprts have been concerned over the past few years, about the declining numbers. 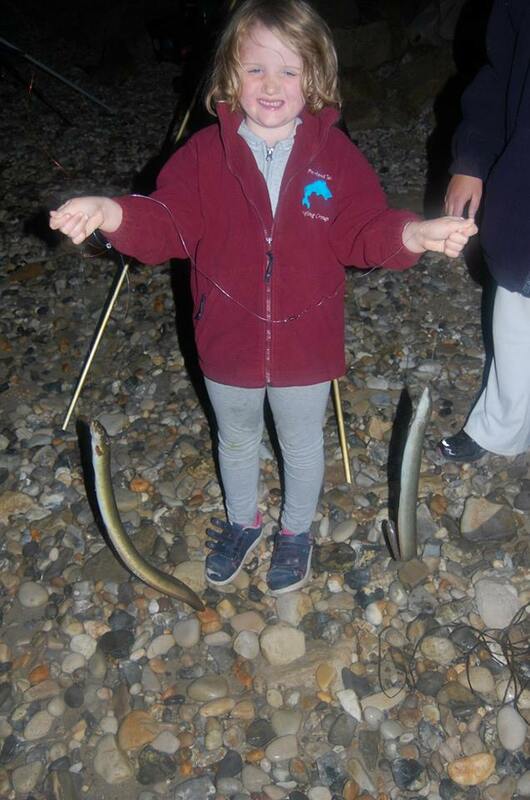 Young Olivia Burridge managed a double shot of Eels from Ferrybridge. I will be entering her for Fish of the Month. There has been a lot of Sole coming from West Bexington and Cogden. Unfortunatly the same area has been targeted by a trawler working out of Exmouth, that has been fishing very close to shore. That combined with a lot of Spider Crabs at that end of the beach, makes fishing that mark a bit harder than usual. Further to my post last week about the Tuna that I spotted of West Bexington, I read yesterday that a Swordfish had been caght in Salmon nets up on the river Tyne. Who knows what wil be on the end of our line, next time we cast out. This year has been very good for Undulate Rays. Plenty have been caught from the boats and the beach. To help you identify Undulates I have put in this picture of one that Phil Rogers caught on Supanova out of Weymouth this week. Undulates are a protected fish and must be returned. Chesil Beach forecast: I will be fishing West Bexington today in search of Plaice, Dabs, Sole and Rays. 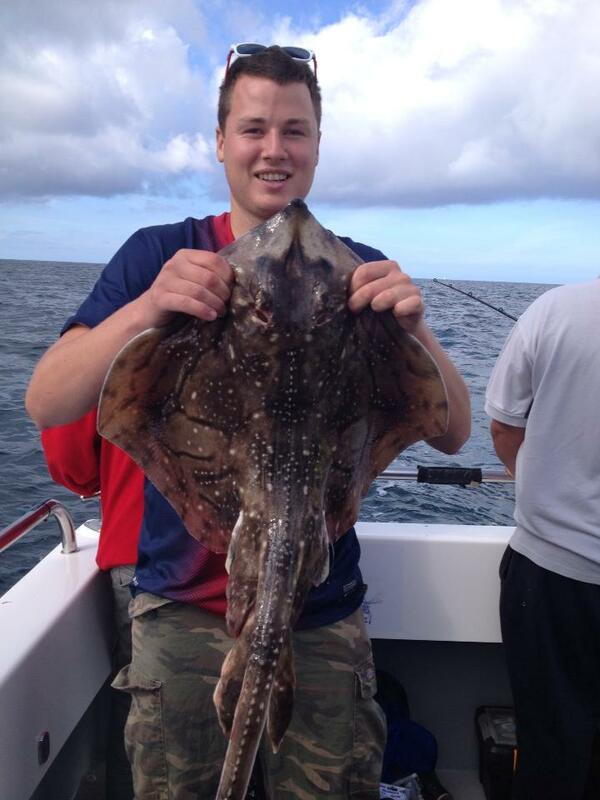 There have been some lovely Plaice and Sole caught recently, even during the day. The Plaice at the moment are really plump and in great condition. Mackerel and Garfish are all along the beach, as are Smoothound. As soon as the sun starts to go down the Scad and Cuttlefish move in close to the shore. Float fishing with Mackerel strip will take both. If you do catch a Cuttle Fish, be careful as they spurt out ink just like squid. There are still plenty of Bream and Gurnard around the Ferrybridge area, with the possibility of a bonus Trigger Fish, especially from Chesil Cove. The Cove is a good mark for Wrasse and Pollock. Portland: I wished I had fished Church Ope Cove last night and the night before. Conditions were perfect, with no wind and a good tide. Tonight should be even better with high water coinciding with dusk. The little bay can often become full of fish at dusk. I have float fished down there in the past and had 5 different species on 5 casts. Portland Harbour: Flounder, Bass and Mullet will be your main targets from the harbour. All the species can be caught very close to the shore with light tackle, making it an ideal mark for novices. You can get Mackerel and Garfish from the deeper parts of the harbour and off the rocks around Portland Marina. Went out Wednesday 6pm till one at Abbotsbury very quite a few gurnard and pouting and nothing else, bites stopped completely after high tide 8.30 pm which I sort of expected but you have to try lol. chatted to a chap who had been there for 24 hours and he had some nice smooth hounds and bass, so there’s still plenty of fish around, just don’t fish a falling tide like I did.